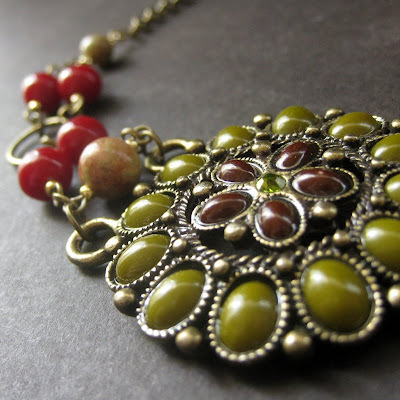 Just in time for fall harvests, earthy brick red and olive green cabochons decorate a bronze floral motif pendant designed into a choker. Bronze chain combined with Unakite gemstone rounds and berry red beads finished off the piece for a handmade beaded choker that's both unique in design and perfect for the autumn season. Unakite is believed, in metaphysical circles, to help one battle and overcome unconscious habits by assisting in bringing one's consciousness into the here and now. It's also believed to provide a unity and balance to one's emotional well being. The lobster claw clasp at the nape hooks an extension chain to make this choker adjustable between 13" - 16.75" in length (33 cm - 42.5 cm) for a perfect fit while a small bead bauble at the end of the chain gives an extra bit of decorative touch.